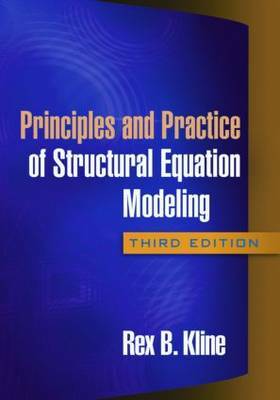 This bestselling text provides a balance between the technical and practical aspects of structural equation modeling (SEM). Using clear and accessible language, Rex B. Kline covers core techniques, potential pitfalls, and applications across the behavioral and social sciences. Some more advanced topics are also covered, including estimation of interactive effects of latent variables and multilevel SEM. The companion Web page offers downloadable syntax, data, and output files for each detailed example for EQS, LISREL, and Mplus, allowing readers to view the results of the same analysis generated by three different computer tools. New to This Edition*Thoroughly revised and restructured to follow the phases of most SEM analyses. *Syntax, data, and output files for all detailed research examples are now provided online. *Chapter on computer tools. *Exercises with answers, which support self-study. *Topic boxes on specialized issues, such as dealing with problems in the analysis; the assessment of construct measurement reliability; and more. *Updated coverage of a more rigorous approach to hypothesis and model testing; the evaluation of measurement invariance; and more. *"Troublesome" examples have been added to provide a context for discussing how to handle various problems that can crop up in SEM analyses.